August 1, 1988 -- A hotel room is a hotel room is a hotel room. Right? Not necessarily. The assistant manager who accompanied me to the room said that Peter, the floor boy, would show me how my room works. He wasn’t just whistling Star Wars. The control panels in Room 601 would excite the envy of the guys (and gals) who man the consoles down at NASA/Houston. The gadgetry pops out just about everywhere: at both sides of the bed, at the entrance to the marble bathroom, and also by way of a remote keyboard. Whatever you use, it’s possible to manipulate both layers of curtains, tinker with the lights, flit around various television and radio channels, and press a membrane to get massages on the television screen. Instructions such as DO NOT DISTURB and MAKE UP ROOM, plus instant access to a valet or floor boy, are also at your electronic beck and call. Not that there’s anything dehumanized about the Peninsula’s new look—the help was as friendly as ever. Just about every one you come in contact with knows your name early on. The owners of the Peninsula, the Hongkong and Shanghai Hotels, have invested US $20 million since last October to spruce up this property, whose familiar façade has been a welcome sight for international travelers since 1928. Just under way is a US $50 million project that will double the number of rooms (to about 425) by 1992. A pair of 15-story towers will flank the original six-floor structure and blend in with the existing architectural design. The original lobby and check-in areas will be maintained. There’s a reason for all the activity at Hong Kong’s oldest hotel. One of the premier hotels in the Far East, if not the planet, the Peninsula has in recent years ceded some of its cachet to local rivals such as the Mandarin Oriental and the Regent. In a broader sense, the once-dominant Peninsula has been eclipsed by such hotels as the Oriental of Bangkok, which often comes out on top in surveys of peripatetic business executives. And thousands of rooms are currently being added to Hong Kong’s inventory. Spurred by the realities of competition, the Peninsula’s owners have instituted the steps I’ve been describing. Just how much ground the venerable property can recoup is anyone’s guess, but the omens are certainly favorable. The renovated rooms are impressive. The chandelier-lit hallways are in rare good taste. The lobby café/bar retains its beehive-like appeal for residents and visitors alike. The shopping arcades are extensive and alluring; every designer you can think of is represented. The Penn will also pick you up and drop you off at nearby Tai Kai Airport, with one of its eight Rolls Royce Silver Spirits (a major purchase at around US$1.5 million). The roundtrip ride, no more than ten or fifteen minutes each way, runs about US $75, but it’s well worth the freight. How often do you get to this glittering (until 1997) Crown Colony? The hotel’s proximity to Kai Tak (both are on the Kowloon side of the harbor) is the reason for the modest fifteen-story height of the new towers-to-be. General Manager Eric A. Walburger explained that the original plan was for thirty floors in each new wing but zoning laws directed by flight patters made this unattainable. You can also eat your way around the world at the Peninsula. There’s continental cuisine at the plush and somewhat formal Gaddi’s, which has a worldwide reputation. There’s the new Verandah Grill overlooking the harbor and the Swiss-oriented Chesa. For Asian dishes, consider the Inagiku Japanese restaurant or the Spring Moon Chinese restaurant, where I was no particularly impressed by the quality of the food or staff. The twenty-four-hour room service is crisp and efficient. Additional food and beverage outlets will accompany the new towers, as well as a business center, fitness complex, a rooftop swimming pool, and additional function rooms. The hotel’s operations will not be impaired during the new construction; it’ll be business as usual. Tipping here is civilized, easy to handle; just about everything that you’d expect carriers a 10 percent service surcharge. Extra change at your discretion. The Hong Kong dollar is still a good value for Americans at about $7.50 to $8 to the U.S. dollar, and English is spoken here. The exit fee at US $12 (down from $16) is still an outrage. More than twenty-five years ago I wrote that the Penn had the best Swiss pastry east of the Alps. It’s still up there. This is a hotel that offers the sort of restrained hedonism I can handle. Add warmth, charm, and courtliness to the mix and you’ve got an institution that’s going to endure. 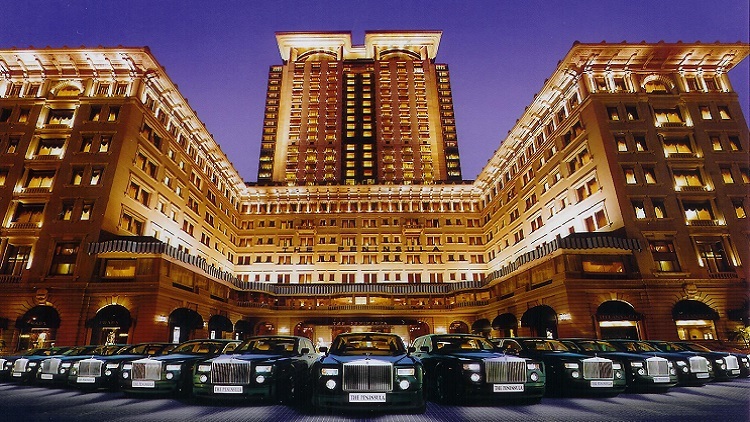 The Peninsula currently rates as Number 13 in Hong Kong by TripAdvisor.com reviewers. A fleet of 14 Rolls-Royce limos remains the hotel's vehicular calling card. But it also offers a pair of MINI Cooper Clubmen and helicopter service. This column is Copyright © 1988 by Martin B. Deutsch. JoeSentMe.com is Copyright © 2019 by Joe Brancatelli. All rights reserved. All of the opinions and material in this column are the sole property and responsibility of Martin B. Deutsch. This material may not be reproduced in any form without his express written permission.